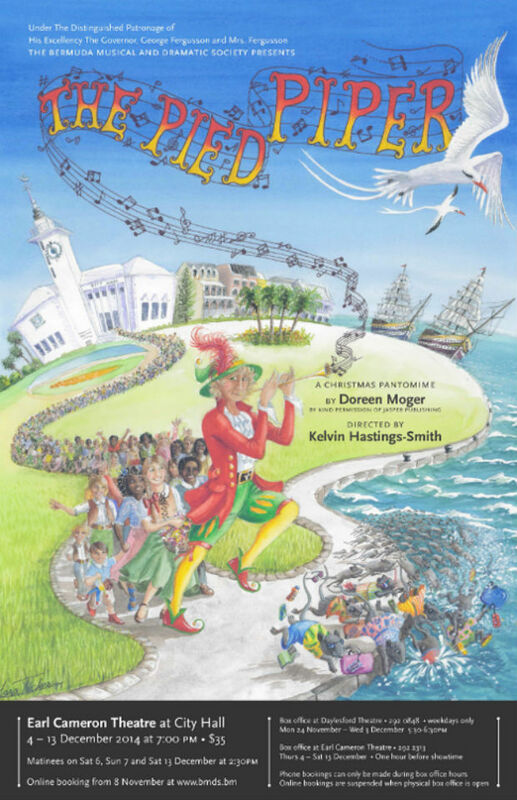 Due to roof damage at City Hall in the recent storms, the Bermuda Musical and Dramatic Society [BMDS] has postponed the pantomime production of the Pied Piper to January 2015, where it will will take place at the Ruth Seaton James Auditorium. A BMDS spokesperson said, “The Bermuda Musical and Dramatic Society has recently been advised by the Corporation of Hamilton that a portion of the roof in the stage area of the Earl Cameron Theatre at City Hall has sustained structural damage as a result of the recent storms. “The damage is serious enough to be considered a safety hazard and it is currently unclear as to when the theatre will be available again for performances. “Therefore BMDS and the Pantomime Production Team, after much consideration, have decided to postpone the Pantomime production of The Pied Piper to January of 2015. “The rescheduled performances will take place at the Ruth Seaton James Auditorium at CedarBridge Academy from Thursday, January 22 to Sunday, January 25, 2015, with two performances [a matinee and an evening performance] scheduled for Saturday the 24th and Sunday the 25th. All tickets that have been purchased online through express.bm for the December production will be automatically refunded. If the refund has not shown on credit/debit card statements by November 22, 2014, please contact info@express.bm. “If tickets were purchased through the BMDS box office at the Daylesford Theatre, there will be physical box office times announced shortly to obtain refunds. According to the production’s official website, the main cast will include Paul Harney, Phillip Jones, Debbie Mello, Kelly Gilmour, Cathal Rynne, Rodney Badger, Shawn Angiers, Emily Ross, Kim Day, Deborah Pharoah-Williams, Alan Brooks, and Jim Brier. The principal chorus will include Subha Chelvam, Heather Conyers, Reuben Flood, David Hicks-Badger, Jo Howson, Angelis Hunt, Erin Jones, Shaquille Lathan, Jennifer Minors, Abigail Powell, Leila Prado, Caitlin Renaud, Kyle Simmons, DeVone Smith, Delijah Symonds, Emma Taylor, Olivia Taylor, and Johnae Tucker. The junior chorus will include Alex Zuill, Ruth Exell, Myah Bridgewater, Honor Minors, Sarah Skinner, Sasha Hosier, Florence Graham, Zakiah Smith, Francesca Morrison, Nekoda Bascome, Tilly Mortimer, Samantha Friesman, Zayler Bolin, and Ravi Cannonier- Watson. So 2015 before the rats are led out? Can’t have it nowhere else? Really?